This motto has represented our line of work since the very beginning. Carving is no easy task. Which part of the piece can be gripped to keep it steady? Which blade do we use? Is the shape appropriate? Even the lubricating oil must be chosen to fit the item being carved. And details as minute as the temperature on the day can also cause differences in the materials we handle. This is why we employ highly experienced craftsmen that possess the unique know-how necessary for our special brand of carving. “Apart from air, we carve anything.” This phrase is not directed towards the sharpness of our blades or the functions of our machines. It refers to our combination of creativity and hard work to make the impossible possible, and our exploration of the limits of sharpeners—all to put a smile on our customers’ faces. Machining refers to the processing method of sharpening a workpiece by placing it in a fixed position and having it sharpened by a variety of rotating tools, such as drills, taps and endmills. If the conditions for sharpening are met, then, depending on the purpose, the object can be milled, bored, drilled, and tapped using one machine. Turning refers to the processing method where the workpiece (mostly blades) is carved by a tool bit. By adjusting the rotation speed of the workpiece and the type of bit and its progression speed (called “okuri”), this method can help produce made-to fit cylindrical parts. 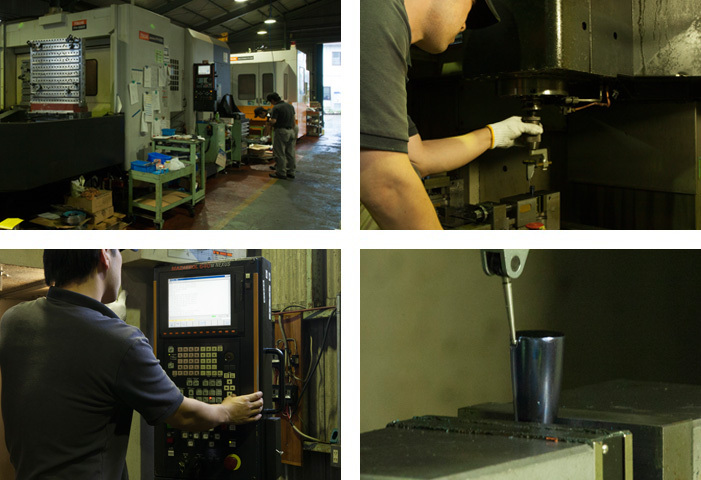 Even though machining is a process where the workpiece is processed by machines, this process cannot be carried out without the expertise of an experienced worker. We cannot simple feed instructions to computers and have them carry out the full process. We are working day and night to make sure that weather conditions, the state of the materials and our clients’ wishes are fully taken to in account to provide optimal results.